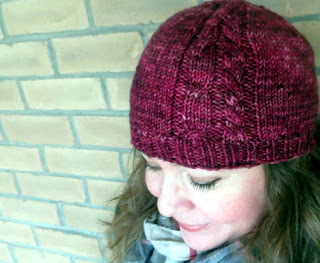 If you've been reading Hugs for a while you may know that on Valentine's Day I share a free pattern as a little love note, a thank-you to everybody who spends time here all year reading my words. It's not a ritual I wanted to give up just because the days are zipping by me right now. I'm calling this hat the Best Friends Beanie, but it started out a little differently. I was writing in a coffee shop about six years ago, taking advantage of dead time between appointments, and couldn't help overhearing a conversational hum from a table nearby. Two women, obviously close friends, were catching up - but one was talking nonstop while the other was offering a very occasional Uh-Huh just to indicate she was still breathing. Probably because I was already doing creative work I couldn't stop myself grinning and picturing their time together in cable form - one cable twisting around and around, the other infrequently turning in its direction. 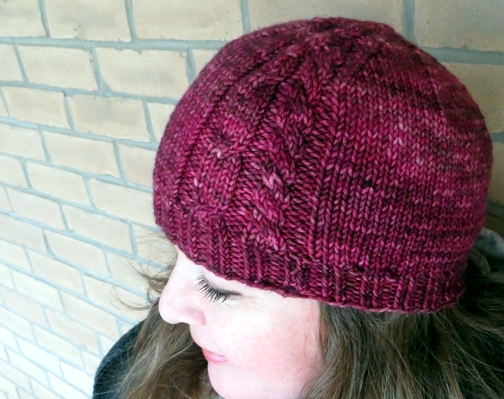 Later on I knit the cables up into a hat pattern and intended to release it here, but my schedule got very busy very abruptly and by the time I could write it up for publication I'd misplaced the hat itself. Naturally, I found it while I was packing everything up a few weeks ago, but by then there was no sign of my pattern notes or yarn information. So I started over in this gorgeous merino cashmere nylon blend from Viola. 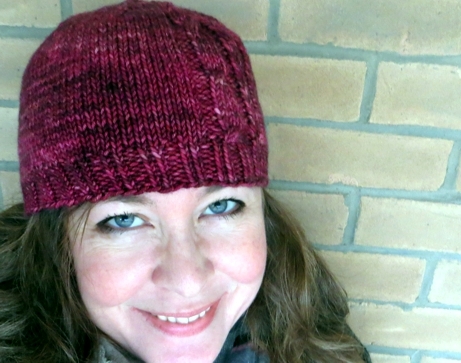 When I was knitting the hat this time, I had a completely different experience of it. I wasn't laughing at the combination of superchatty and silent any more. I was recognizing myself in both roles, and deeply aware of the value of the quiet partner. There have been so many times since my coffee shop day that I've needed support and insight and turned to a friend who could hear me out and offer guidance. And there have been so many times that I've seen someone going through a truly awful experience - divorce, or grief over a loved one's illness and death - and offered myself as a resource. Friends need each other in different ways at different times... basically, we are all these cables. I thought too about Pete and me and our marriage, how we've been incredibly lucky to be able to take turns being the quiet support. It's very rare that we've both been the whirling cable at the same time, and even when that's happened, one of us has been able to take a deep breath and be calm for the other. We've survived some tough times - really tough, things we never imagined happening when we were saying our vows - and we've come through them stronger than we were before. That's partly because we have kept ourselves turned toward each other like these cables do, with a keen awareness that we are in it all together, but also because we've been able to see when we're needed more than we need something for ourselves. This beanie - toque? stocking cap? - is a different shape than I've been doing lately. It's very close fitting and stretchy, which makes it very fast to knit with less yarn than some. I feel it could be unisex, but maybe for a man you'd want to leave out the cables. Probably the experience of knitting them is more meaningful than wearing them! I found it very meditative and comforting, myself. Solid or semisolid worsted-weight yarn - I used Viola M/C/N worsted in 'Mars' - with a good stretch. 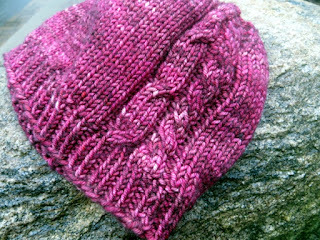 I would not recommend any yarn that doesn't have at least 80% wool content for a hat with as much negative ease as this one. 20 sts, 31 rows - 4" in stocking stitch. Sizes S (M, L) - 16" around, 6-3/4" long (18-1/2" around, 7" long, 21" around, 7-1/2" long) - shown in size M stretched around my 22" head. What a great hat! It'seems been getting warmer on the estate Coast though it still gets chilly in the evenings.Thank you forsharing this pattern. Hope you have a great Valentine's Day! So glad you like it Bonny! Thanks Mary for this pattern. I really enjoy reading your blog, especially since I live in the suburbs of TO and know the places you talk about. I picked up your hint about using a tray when knitting to keep track of needles, etc. Hope you have a great weekend, despite the cold. Hi Mary and thank you for the pattern. It looks great and I already cast on. * to end of round - 90 (99, 108) sts. Gah!!! Danica, you are right: typo. Thank you SO much for letting me know. You are indeed increasing 2 stitches for every 9, which brings you to 117 stitches. Knit it as written and by the time you get to the crown, which is also going to be wrong, I will have corrected my mistake and posted a revised pattern. I am hugely sorry to have let that slip past me!! Love the hat and thanks for the pattern. The yarn is a beautiful color! Okay, all clear now! New pattern at the link. Thanks again Danica! You are so welcome Rhonda! 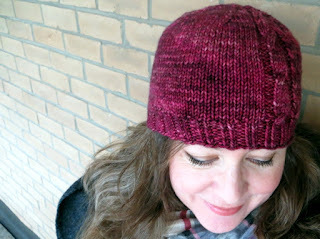 and yes, that yarn is gorgeous... Emily is just amazing with dye. She even does an off white called Ghost that should be boring as chalk but absolutely isn't. The talent!